The coenzyme Q10, which is also called CoQ10, isn't a new finding. It was first identified back in 1957 at the Enzyme Institute of the University of Wisconsin. Dr. Fredrick Crane's research isolated the coenzyme from a beef heart, and after further study found that not only is Q10 a naturally occurring compound, but it is also a powerful antioxidant which occurs in nearly all plant and animal tissue. This includes humans. As a coenzyme it assists the body in a variety of internal processes. Cells use this fat-soluble coenzyme to obtain energy from food, and our vital organs like the heart, kidneys and liver need this cellular energy to function properly. Without this energy, your cells can't work like they need to for good health and if your body is deficient in this coenzyme, it can even lead to heart disease or other serious conditions. If you take statins to lower cholesterol, it's important to note that these drugs may lower your body's natural supply of Q10. Because the heart has high energy requirements, coenzyme Q10 is an essential compound for the heart to work properly. Statins work to inhibit enzymes involved in the production of cholesterol, but unfortunately, they also work to inhibit the production of Q10. If you are currently taking a statin or your doctor is thinking of prescribing one for you, it is a good idea to talk to your health care provider about taking a CoQ10 supplement, to help combat the depletion of the coenzyme and to avoid other possible negative health effects. CoQ10 is imperative to maintaining cardiovascular health. Studies have shown that a group of cardio patients who suffered a recent myocardial infarction and who also took aspirin, statins and 60 mg of a CoQ10 supplement (two times a day) each day reduced their likelihood of another cardiac event for one year. Blood Sugar: Benefits for those with diabetes include improved function of endothelial cells lining blood vessels. The result is that it might provide help with controlling blood sugar. High Blood Pressure: CoQ10 may also help to bring down high blood pressure in some people. Repairs muscle damage caused by statins: Statin drugs can cause muscle damage (and pain). 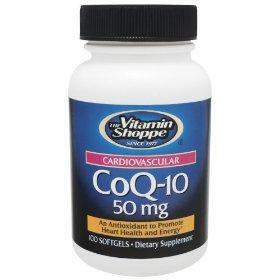 A small study published the American Journal of Cardiology (May 2007) says that CoQ10 supplements may be helpful. CoQ10 supplements can be purchased in a wide range of dosages, which may leave you scratching your head as you read the labels. How much is right for you? Some experts believe that high doses may be detrimental to your health and could produce unwanted side effects. Since dosages range anywhere between 10 mg and 300 mg capsules, a realistic place to start would probably be about 50 mg. However, this is one supplement that it really is best to talk to your doctor about before you start taking it. Look for his or her recommendation. Your doctor knows your medical history including what drugs you're taking and any other medical conditions that may be affected. Not only that, but higher doses of CoQ10 may be required for certain medical conditions and your doctor will know that as well.